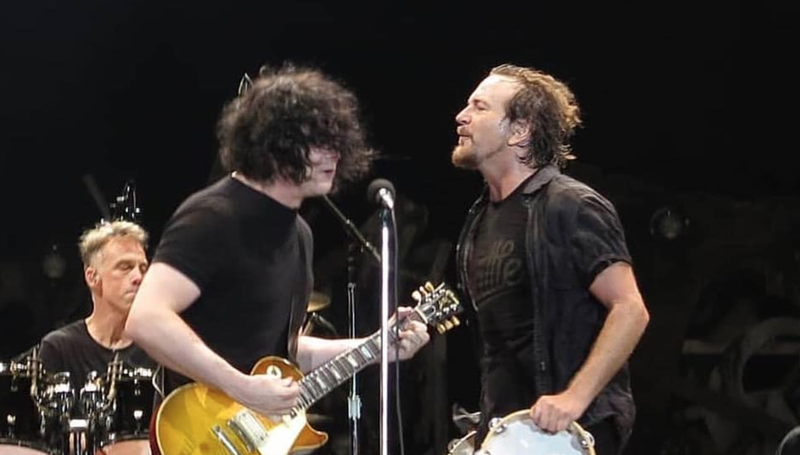 Pearl Jam were joined by Jack White for an encore performance of the Neil Young classic, “Rockin’ In The Free World”, at Portugal's NOS Alive festival on July 14. The Portugal stop marked one of the final shows of Pearl Jam’s summer European concert series, which wraps up with a July 17 date at London’s O2 Arena that was originally set for June 19 but postponed after singer Eddie Vedder lost his voice during the second week of the trek. The group will next begin a series of US stadium shows at Seattle’s Safeco Field on August 8 and 10 while pledging a minimum of $1 million toward local homelessness initiatives and challenging everyone to join them towards raising a minimum of $10 million for the cause. Following the hometown gigs, Pearl Jam will perform at Missoula, MT’s Washington-Grizzly Stadium on August 13, as well as two nights at Chicago’s Wrigley Field (Aug 18 & 20) and a pair at Boston’s Fenway Park (Sep 2 & 4).